Looking to develop your business presentation skills? Let’s see if our approach to presentation skills training is for you. Michelle’s Persuasive Presentation Skills Masterclasses have been attended by thousands of people from hundreds of companies. Widely accepted as the premier training option for becoming a confident, engaging, persuasive presenter in business. Confident, effective presenting in business is about a whole lot more than just stagecraft and slide design. Attend Michelle’s 2-day Persuasive Presentation Skills Masterclasses and you will transform your approach to presenting from the ground up. Michelle has sold over 8,000 copies of her book, ‘How To Present; the ultimate guide to presenting your ideas using techniques that actually work’. If you want to be a more effective, confident presenter, choose to work with the expert. Corporate focus – Michelle’s 13 step model is tailored to professionals, managers and other corporate people who make business presentations. It’s a life-changing experience – for proof just read the dozens of testimonials. Group sizes are limited to only 10 people – the learning experience is interactive, personalised, and packed with personal coaching from Michelle. You’ll only work on your own company content during the program so it’s as relevant to you as possible. Techniques are embedded so you remember them decades later – just ask anyone who has completed this program over the past 20 years. You’ll learn a logical system for designing your presentation so you dramatically improve your ability to connect with your audience. Techniques are useful in everyday life, not just formal presenting in business. Michelle has specialised in this subject area for over 2 decades – this is her passion. Programs are held in state of the art training rooms with delicious catering – an experience to remember. …. and we promise no hand-holding, crying, fire-walking or even video-recording – there’s actually a better way. You can be a Persuasive Presenter in business! Want to know more about our Public Masterclasses or how Michelle can run her renowned Persuasive Presentation Skills Masterclass in your organisation? Michelle Bowden, author of the best-selling ‘How To Present’ (Wiley), is a qualified adult educator (MEd. Adult Ed.) and a successful conference keynote speaker. In 2009, Michelle was designated a Certified Speaking Professional (CSP). Michelle runs her 2-day public workshop every month in Sydney as well as in Melbourne, Brisbane & Canberra. She’s facilitated her Persuasive Presentation Skills Masterclass more than 800 times for over 8,000 delighted participants…. 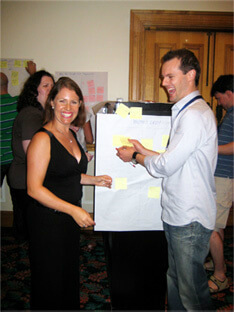 I thoroughly recommend Michelle's 2-day presentation skills course. You will pick up many tools and techniques and Michelle's infectious personality makes it painless.